Looking for a way to introduce food into the workplace in a more sophisticated manner? 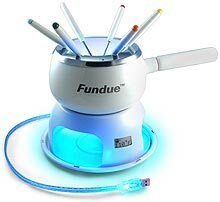 Look no further than the Fundue, a desktop USB fondue set. Yes, that's right, just plug this baby into your USB port and invite a select few to your desk for a fondue par-tay.  The set includes a pot and base, an LCD display that shows temperature of oil, a heater that glows blue with an LED and of course, FireGlow USB cables. Add to that the 3 Fundue forks with monitor attachments and of course, software to show you how it's all done, and you'll be the most popular chap in cubicle town. Except for that guy with the Air Guitar Project, of course. All this for only $29.99. Virtual Air Guitar, Art or Folly?